This spectacular adventure treks through the Annapurna foothills to the wild and remote Kopra Ridge, one of the best vantage points in the Himalaya. Time spent in Kathmandu and Pokhara completes the adventure with insights into Nepali culture and tradition. This is the perfect trek for those who would like to experience some of the best trekking trails on the planet without the demanding impact of high-altitude ascents. Trekking the Annapurna Region is one of the most jaw-dropping and stunning places in Nepal, you’ll be absolutely captivated by the area from the very first day. Winding through some of the world’s tallest mountains and diverse climatic zones (from tropical to freezing alpine peaks), with superb views of the Annapurna’s and Dhaulagiri, it’s no wonder this remains one of Nepal’s greatest hiking destinations. Whilst the journey is still quite demanding, it is an excellent introduction to walking in the Himalaya. Starting and finishing your epic mountain journey in the renowned Kathmandu with its colourful temples, city squares, and colourful markets. With the support of a team of expert Sherpas, the challenging trails of Annapurna will reward you with a stunning combination of towering peaks and dramatic valleys to enjoying the beautiful hospitality of the Nepalese people and their quaint mountain villages. This is a challenging trek with 6 days walking however it is achievable and has been designed as an ideal introductory itinerary to trekking in the Himalayas. The maximum altitude is 3650m and we recommend this trek to those who want a thorough overview of the Nepalese Himalaya. The hiking on this trek is generally quite moderate and mostly on well-established trails. The trail crosses numerous modern suspension bridges over rivers and valleys; all have mesh sides and none are especially high, however, anyone with a strong fear of heights or vertigo may find them difficult. You will be fully supported throughout your trek by Adventurous Ewe Mountain Leader (for groups over 6 trekkers) and your local Mountain Guide and crew. The tour includes all accommodation, private transfers, park entry fees, porters, local guides, cook and meals whilst trekking. Breakfast is included in the Kathmandu hotel. It does not include insurance, airport tax if applicable. If anyone needs to leave the group at any point during the trip (for reasons such as an early descent from due to altitude sickness or other reasons), all expenses incurred until re-joining the group on the itinerary described in these Trip Notes are the responsibility of the individual(s) concerned and must be paid to our local operator before leaving Nepal. The easiest way to book your trip is online via the Adventurous Ewe website. You will need to pay a non-refundable deposit of £195 at the time of booking. It is possible to reserve a place on this challenge by email to info@adventurousewe.co.uk, however you will need to pay your deposit of £195 to confirm your place on this trek together with completing a booking form. The full balance is required to be paid no less than 4 weeks prior to departure. Arrival in Kathmandu and transfer to your hotel where you will meet your fellow trekkers and local Nepalese Guide. There will be a briefing of the expedition ahead and your chance to ask any questions and make any last-minute preparations. The remainder of the day is at your leisure or you can join an orientation walk around the inner part of the city through the backlanes and old market square (time permitting). An early start today with breakfast in the hotel followed by taking one of the first flights in the morning to the City of Pokhara (35 minute flight), the gateway to the Annapurna Region. It’s the perfect way to see enormity of this region with fantastic views of the Himalayan mountains. In Pokhara you will rendezvous with your wonderful trek crew who will accompany and support you throughout your trek. From Pokhara you will be transferred to Nayapul (approximately 1.5 hours), then into the Annapurna Conservation Area and further on to Kimche along rough roads however the spectacular scenery through Modi River Valley will provide the perfect distraction (1hr approx). This is where your trekking adventure begins to Tadapani at an altitude of 2590m. Starting with a short uphill walk you will reach Ghandruk, (1940m), a popular and ornate ‘Gurung’ village which has grown large and prosperous on the pensions of retired Gurkha soldiers. You will be rewarded with dramatic views of the peaks of Annapurna South, Gangapurna, Hiunchuli and the all-so-famous Machhapuchhre. Following lunch at Ghandruk, your trek winds uphill for the most part of the afternoon passing through mountain forests and the views of Annapurna South and Hiunchuli become increasingly closer and even more impressive. Your first day of trekking finishes in the small village of Tadapani which is surrounded by impressive mountain forests. You will overnight in a traditional tea house. The perfect place to awaken this morning with the serenity of the Himalayan mountain landscape. 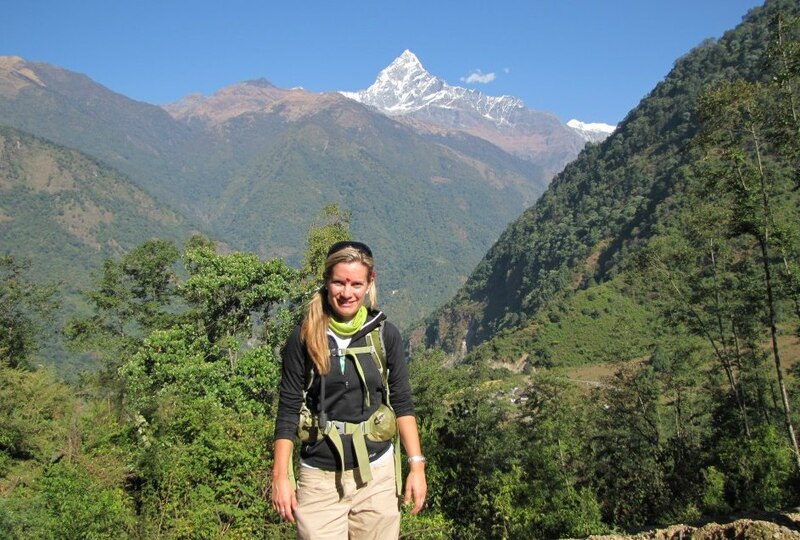 As part of this unique trek you will veer off the popular Annapurna trail to experience the less-trodden Khayer trail. The trail winds its way gently uphill through charming rhododendron and magnolia forests, with daphne bushes and orchids hosted by the larger trees. You will see storm-torn trees broken by the winter snows & wind before reaching a picturesque meadow complete with a small stream. Reaching a minor mountain pass, you continue through the rhododendron forest descending to a clearing in the midst of woodlands which is Bayalikharka at an altitude of 3450m. This morning your trail descends and twists its way down through the woodlands to the stunning pasture at Lower Chistibung. Your trail then gradually ascends up a forested hill through meadows, to reach a makeshift herders’ settlement at Chistibung (2990m). The latter part of the day involves a continuous climb breaking through the tree-line into alpine mountain terrain. This marks the highest point of your trek at the unbelievably beautiful Khopra Danda (Kobra Ridge) at 3650m. Renowned to be “somewhere between Heaven & Earth”, the views from Kobra of Annapurna South (7219m) Baraha Shikhar (7647m) in the foreground and the peaks of the Nilgiri away towards Mustang and westward to the hulk of Dhaulagiri, where later the sun will set, are filled with the ultimate wow factor. This, plus the encounters with the friendly villagers, will make anyone want to come back again and again. Keep your eyes peeled to catch a glimpse of the Himalayan Tahr and the beautifully hued national bird of Nepal – the Danphe. For those who wish, there’s an optional hike to nearby hill-tops. Set your alarms early as you definitely don’t want to miss the spectacular sight of the sun’s first rays lighting up the Himalayan peaks. It’s a sunrise that you’ll treasure for a very long time to come. The trek then resumes with a steep descent through meadows to Chistibung, with a number of herder’s huts and dzo grazing (crossbred cow and yak). The path continues to descend through rhododendron and oak forests with more views of Mount Dhaulagiri providing a lovely backdrop to the terraced fields and traditional houses in the nearby villages. Finally you will reach the village of Swanta. If you wish, you can visit Swanta Primary school, a community supporter school where there are two teachers funded by the profits from the community lodges. The morning starts with an undulating path to the village of Chitre passing through forest and hamlets. You will reach the famed village of Ghorepani for lunch and it is here you will re-join the popular Poonhill Trek route, giving you a sense of appreciation of your quieter days trekking the Khayer trail. Your path is a continuous descent on stone steps to Ulleri approx. 3.5 hours. This is your final day of trekking where the trail out of the Annapurna begins to level as you pass Birethanti and on to the roadhead at Nayapul. Here you’ll meet your private transport for the return drive back to Pokhara. Spending one night in Pokhara near the stunning Lake Phewa gives you the chance to relax or further explore the lakeside district of markets, visit the International Mountain Museum (time permitting) or just sit back and enjoy the spectacular scenery from one of the many restaurants or cafes. Today sees you depart the gateway to the Annapurna range as you take your return flight from Pokhara to Kathmandu filled with many found memories and great adventure stories. The remainder of the day is yours to experience, the sights, sounds and smells of Kathmandu. Whether you’re barrelling through the traffic-jammed alleyways of the old town in a rickshaw, marvelling at the medieval temples or purchasing some last-minute Nepalese souvenirs, Kathmandu can be an intoxicating and amazing place. You may wish to visit the UNESCO-listed Durbar Square in the heart of the old city where the old Royal Palace is located. Outside is Kumari Chowk, home of the Kumari, the young girl who is revered as a living goddess. Stroll through the backstreets and Kathmandu’s timeless cultural and artistic heritage still reveals itself in hidden temples overflowing with marigolds, courtyards full of drying chillies and rice, and tiny workshops. Or you may wish to visit the monkey temple at Swayambhunath, one of the largest Buddhist Stupas in the world at Bodnath, or the most important Hindu temple in the valley at Pashupatinath. Feel free to speak with your Nepalese Guide if you have any questions or need any directions. Transfer to Kathmandu Airport for your flight back home. Please note, the itinerary is subject to minor changes depending on flight arrival and departure times, weather, the ability of the group, etc., but the itinerary outlined provides an excellent indication of the trek and what you will experience. Food and drinks are not included in this trip to give you the opportunity to sample a variety of local Nepalese food, purchase lunches from local tea houses enroute in order to support the local communities and the chance to order off the menu in the tea houses for evening meals you wish to have. Plus we know from experience that the small degree of altitude and physical exercise can meal your appetites may differ for other members of your group. Nothing gets you over a looming mountain pass like the promise of a home cooked meal waiting on the other side. Teahouses on the more travelled routes offer a surprising variety of world cuisines these days, ranging from Chow Mein to Pizza and Mac and Cheese. The staple food of Nepalis is the . This plant-based dish is always fresh, kind on the stomach and provides the best fuel to battle the strenuous terrain of the Himalayas. A plate of Dal Bhat includes steamed rice, lentil soup, vegetable curry and sautéed spinach. Another popular snack is momos; a type of Nepalese dumpling, fried or steamed, filled with meat or vegetables. Lunch will be taken at a teahouse en route. Dinner and breakfast will be in the same teahouse that you overnight in. Teahouses can also serve as a very welcome pit stops to fill up on trail snacks like tea, biscuits (try the coconut ones) and chocolate bars. Availability of meat will vary and is especially scarce in remote and high altitude places, as well as near sacred sites. If you are used to a protein rich diet it could be a good idea to bring along some protein bars and snacks for your trek. It’s also worth taking into consideration that the meat is not transported and stored in conditions that we are accustomed too. The meat has often been carried in the heat from lower altitudes for several days before reaching the lodges, and can cause stomach upsets or illness, therefore we would recommend not ordering meals with meat whilst on the trek. Vegetarians are well catered for in Nepal. If you have a gluten free diet, then we strongly recommend you bring some extra food and snacks with you to supplement the food on trek as there will be little variety available for you, particularly for breakfast. It’s also worth noting that many of the soups are from powder/packets and contain gluten. How much you need to spend per day will vary, but it could be anything up to US$25 per day for meals, snacks and drinks. Prices tend to get higher the higher you go on trek in response to the difficulty of getting supplies to the teahouses. If you buy imported food and drink whilst on trek you will spend more than the suggested amount. Staying hydrated is important when undertaking any physical activity but particularly so at altitude where it is generally recommended to drink at least 3-4 litres per person per day. We strongly encourage you not to buy bottled water on trek as this contributes to the growing problem of plastic pollution in Nepal’s trekking areas. Some villages along the Annapurna Circuit route have safe drinking water stations selling UV treated water for Rs40-50 per litre but these are not always open. The teahouses also sell boiled water for approx. Rs150-300 per litre (the price increases the higher you trek) which should not require treating. This is also perfect for a bedtime refill as it can double up as a hot water bottle. Alternatively, all teahouses will provide cold water free of charge, if requested. Although this should not be drunk untreated, we recommend that you bring a reusable bottle (or two) and use an effective form of water treatment. There are a wide range of products available these days which are more effective than traditional purification tablets – we recommend talking to an outdoor retailer for the latest advice as technologies are improving all the time: make sure to check the product’s performance in cold/freezing conditions and consider battery life (lithium batteries are best in cold conditions). Handheld UV filters such as a ‘SteriPEN’ are widely available to purchase from online retailers such as Amazon and eBay – they’re very effective, can treat 1 litre of water in a couple of minutes and the water is ready immediately – look for lightweight lithium battery models and remember that you will need to bring a wide-mouthed bottle (e.g. Nalgene) for use with these devices. There is also an array of water filter and purifier bottles on the market, such as ‘The Grayl’ or ‘Water-to-Go’ but please note that these tend to have a small capacity and the filter systems will be less effective if they freeze so are less practical for high altitude treks such as this. Guest house or similar (2 nights), Local lodges/tea houses (6 nights). In Kathmandu, we usually stay at the Kathmandu Guesthouse, located within the vibrant Thamel district. All rooms have en suite facilities and there is a restaurant, a bar and an outdoor courtyard. The best way to experience trekking in the Annapurna Region is to stay at a locally owned tea house scattered along the different mountain trails. Originally, teahouses were little shops where travellers could stop for a rest and a cup of tea. With time these teahouses have developed into full-fledged mountain lodges offering food and accommodation to guests. Most of the teahouses are owned, managed and inhabited by local families. This gives you a rare glimpse into the culture and daily lives of the local people in rural Nepal whilst also supporting their livelihood. There is nothing like falling asleep after a long day on the trails to a panoramic display of mountains outside your bedroom window. On the inside, the accommodation is simple, yet clean and functional. The rooms usually include single sized beds with sheets, pillows and blankets. Some trekkers prefer to bring their own sleeping bag liner and sleeping bag for hygienic reasons and additional warmth. Rooms are quite drafty, and with no heating available be prepared for cold nights the higher up in the mountains you go. Similarly, the walls are quite thin so if you are a light sleeper you may want to consider bringing earplugs. The hub of the teahouse is the dining room, usually decorated with colourful traditional rugs, sometimes with a stove or heater (some lodges charge a fee to put the heater on). All teahouses sell snacks and other essentials such as tissues, soap and toilet paper. Most lodges have electricity but it is not wholly reliable and lighting may not be bright enough to read by – a torch is essential. Electrical charging facilities are generally available only in the dining room (charged at approx. Rs150-350 per hour per device). Please note that many of the lodges use solar power so sometimes there is not enough electricity for charging. Many lodges have Wi-Fi these days – in some areas it works well but in others it is slow and temperamental. Most lodges have only one or two basic toilets and sometimes these are located outside the main lodge building. Toilets are usually ’squat’ style; although some lodges have now installed ‘western style’ seated ones. Toilet paper is not provided so you should bring your own or buy it locally (please dispose of it the bin provided – do not put it in the bowl). If there is not a flush handle, there should be a container of water to pour down – if it is empty (or frozen) please either refill it or ask the lodge to. Some lodges now have gas or solar hot showers (charged at approx. Rs250-500 per shower) but don’t expect them every night. Sometimes a hot shower is simply a bucket of hot water and not a shower head. Standards of cleanliness vary especially in the peak trekking season and in winter when the water freezes at night. Please report any problems to your leader or the lodge and be vigilant in your personal hygiene regime – use soap or hand sanitizer gel before and after toilet breaks, snacks and meal times. As a general rule, the higher altitude you go to, the more basic the lodges and the more expensive food and services become. Non UK nationals should check requirements with their nearest embassy (a few nationalities are not permitted visas on arrival). Airport transfers and transfers to and from the start and finish of the trekking point will be via private mini bus. All mini buses are fitted with seat belts. Roadworks and infrastructure projects can cause significant delays on major roads within cities and highways between destinations. Road travel can also be disrupted due to demonstrations and bandhs (strikes) without warning. Major roadworks are currently ongoing in and around Kathmandu. Delays, heavy traffic, poor road conditions and dust are a reality of road travel in Nepal. For this trip there is a return internal flight between Kathmandu and Pokhara. Please see the trip notes for more important information on air travel in Nepal. Travel insurance is compulsory for all our overseas expeditions. It is a condition of joining this trip that you must be fully insured against medical and personal accident risks (to include repatriation costs and air ambulance or helicopter rescue services where appropriate). We strongly recommend that the policy also covers personal liability, cancellation, curtailment and loss of luggage and personal effects. On arrival in destination for your trip, you will be asked to present evidence of travel insurance and the insurance company’s 24-hour emergency contact number to your Leader or the Local Representative. If you have credit card insurance your Leader will require details of the participating insurer/underwriter, the level of coverage, policy number and emergency contact number rather than the bank’s name and credit card details. Please contact your bank for these details prior to arriving in-country. Please ensure that your travel insurance covers you for all activities that are part of the trip, optional activities that you intend to take part in and/or on high altitude itineraries, that you are covered up to the maximum altitude of the trip. We also recommend that you enrol with Global Rescue prior to embarking on your trip (optional). Global Rescue is the world’s premier provider of medical & security advisory and evacuation services http://www.globalrescue.com/adventurousewe/. This trip includes one night over 3500m above sea level where there is a genuine risk of being affected by Acute Mountain Sickness (AMS). (Night 4 is at 3650m and night 3 is at 3450m to help with acclimatisation). If left untreated AMS can be life-threatening. Our itineraries are designed to enable everyone to acclimatise to these altitudes, but you should be aware that it is still possible for you to be affected. We expect some trekkers to experience some mild symptoms of altitude sickness, such as headaches and shortness of breath while walking or sleeplessness. Our Leaders are trained to identify symptoms of severe AMS and if a trekker requires extra care, assessments and arrangements such as rapid descent will be made immediately. To complete this trip comfortably, it is preferable that you have previous trekking experience in varied and irregular terrain carrying a 35 litre day-pack. The walking is not dangerous or technically difficult, though you must be a confident walker with a good level of fitness. During the trek you will be required to carry your own kit including packed lunches & snacks, drinking water, wet weather gear, additional warm layers and personal items such medication and toiletries. The walking hours stated are given as approximates only. Timings include lunch and photo stops though will vary depending on the pace of your group and weather conditions. Previous experience at altitude not required. Full instructions and support will be provided by your guides. Nepal is one of the safest countries for travellers and serious crimes are rare. But as with all places where tourists and crowds gather petty theft can be a problem. In the same way that health risks can be avoided with a few sensible precautions, so can security risks. While we will do everything to provide adequate safety for the group and security for your possessions, the general rule is that if you don’t need it, don’t bring it. This includes jewellery, necklaces, rings and even watches. Any valuables such as your passport and money should be kept on you at all times or kept in the hotel safe. Do make photocopies of all your important documents, including passports, and keep copies of emergency. Adventurous Ewe is committed to delivering travel experiences in a responsible and ethical manner and with sustainable development at its core. We respect and aim to operate our adventures and events to benefit local people, their cultures, economy and the environment! We Employ Local Experts. Areas are left exactly how we found them. We understand the need for care. Three Peaks Challenge. Fully supported challenge from £315.00. Discounted price for group bookings. We offer Bespoke Trips. Subject to availabilty we are able to do trips that cater for you and take you to areas of the world that you would like to go.